The hype surrounding the 2018 FIFA World Cup is about to reach boiling point. Managers are starting to put their squads together, players are praying that they don’t pick up any major injuries, and the infamous Panini sticker book has already been released. Yep- it must be a World Cup year. We’ve been treated to a shed-load of fantastic kit releases over the past few months, as the biggest football brands in the world continue to unveil their stunning designs. With the guys at Nike and adidas being particularly busy with new releases, the likes of Umbro, Puma and New Balance are also looking to make their own mark this summer. Well, now adidas have taken things one step further, by unleashing a stunning range of nine (yes, NINE!) away kits for World Cup 2018. Bringing a mixture of retro style and modern design, it’s safe to say that this new collection has got us drooling with anticipation. If you ask us, the World Cup just can’t come quick enough. Introducing the @DFB_Team 2018 @FIFAWorldCup Away jersey. Current World-champions Germany have been given an absolutely stunning retro look, as the likes of Mesut Ozil and Mats Hummels show off a vibrant green colourway. Paying homage to Germany’s iconic World Cup semi-final win against England in 1990, this fantastic strip provides a blast from the past that could just drive the Germans onto more success in Russia. This Germany kit is a modern twist on a real classic. The pattern on the front of the shirt draws inspiration from the home shirt released late last year, while the words “DIE MANNSCHAFT” are displayed proudly on the back. With a gold badge displayed proudly on the chest to represent their triumph in Brazil four years ago, the Germans certainly aren’t shying away from being the team to beat. Hosts Russia will be showing off a brilliant white number, which offers an abstract graphic depicting key elements of Russian architecture, while it also follows Japan in celebrating the street scene throughout its design. 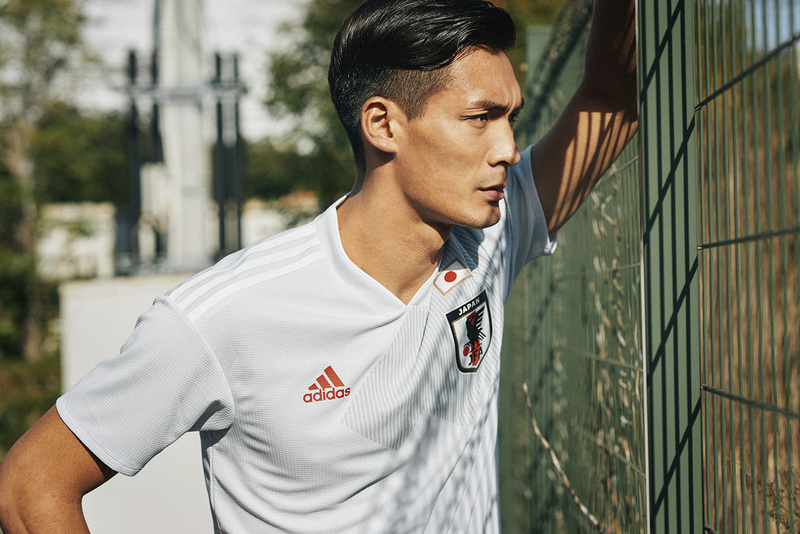 The Japan kit offers its own white colourway, providing an updated version of their classic kit from 1991. England fans will no doubt be paying close attention to what Belgium have to offer here, and it’s fair to say that The Red Devils have got one of the most beautiful kits of the entire tournament- never mind just this collection. 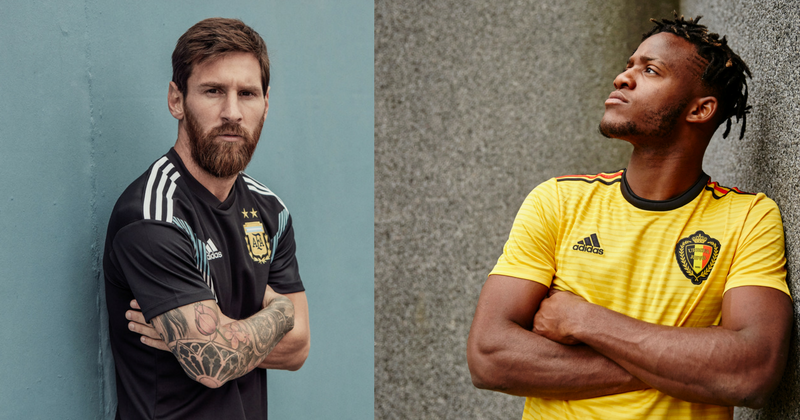 Implementing the bold colours of their national flag, adidas have allowed the vibrant yellow to take centre-stage here, creating one of the most intimidating kits you’ll see this summer. With Michy Batshuayi in such fine form for Borussia Dortmund, there’s no doubt that yellow just might be his colour. England fans, you have been warned. 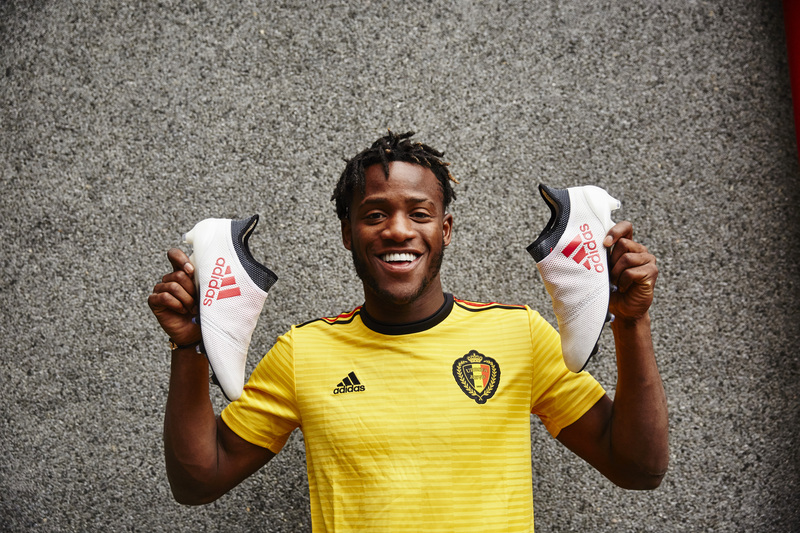 Subtle red and black details offer the perfect complement to this vibrant football kit, as Belgium look set to bring one of the most colourful kits ever seen at a World Cup. As for those that are accustomed to playing in yellow, Colombia and Sweden have both been given dazzling blue designs for their away strips. The Colombians will be showing off a fantastic kit that incorporates a bold graphic alongside vibrant orange details. Inspired by the traditional scarf patterns famous in their country, the kit comes complete with the words “United As One Nation” in a real show of Colombian pride. La Roja 🇪🇸@Koke6 introduces the @SeFutbol 2018 @FIFAWorldCup Away jersey. Former champions Spain will be hoping for a much better World Cup campaign this time around, as their new kit pays homage to their classic look of the 1980’s. Creating a bold kit with a white colourway and red stripes, adidas have also incorporated a light blue graphic across the front to pay homage to the retro style of the 80’s. Down in South America, Argentina will be sporting a black strip for the first time in their history, as Lionel Messi and co. look to go one step further than they did four years ago. Meanwhile, Mexico have been given a lovely, simple design which beautifully utilises the colours of their flag through the use of bold stripes across the chest. Introducing the @Argentina 2018 @FIFAWorldCup Away jersey. But which is your favourite design? We might have turned into fan-boys of the new Belgium strip, but let us know whether you agree with us in the comments below! FOOTY.COM will also be comparing prices on all of these adidas football kits soon, so make sure to check out our site to bag the best deals on your favourite design!